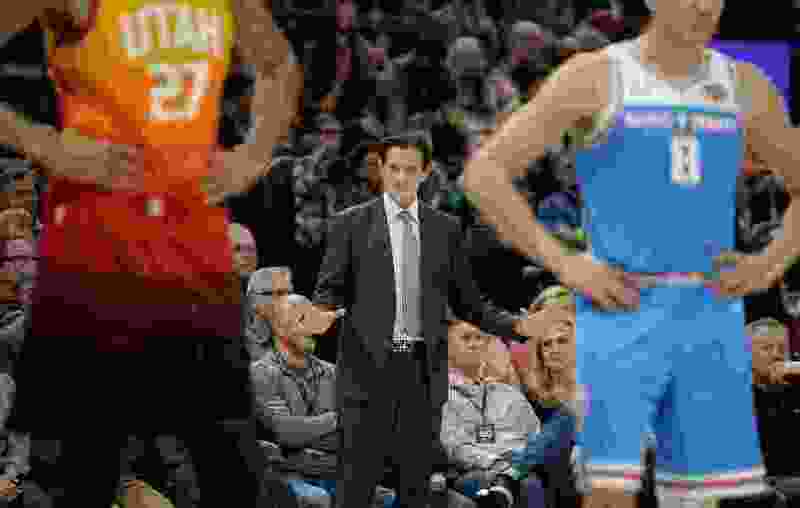 Quin Snyder isn’t afraid of a good idea, no matter where it might come from. Even if it’s from the Domino’s Pizza delivery guy. Snyder, sadly, didn’t save the play. He wishes he still had it now, but said that because his Missouri team that year didn’t have a lob threat — Keyon Dooling had left for the NBA — he threw the pizza box away. But the story goes to show the dedication of Snyder, and other NBA coaches, in adding to their playbook with the next concept that will earn them the most valuable of NBA commodities: a bucket. Clippers coach Doc Rivers, for example, once got a play from watching his son, Austin, at one of his high school games a decade ago. “They ran a play and I was like, ‘Wow, that’s sweet.’ We ran it, we called it ‘High School,’ " Rivers said. At the height of the championship Celtics team coached by Rivers, Kevin Garnett, Paul Pierce, Ray Allen and the rest were running a play drawn up by a high school coach. “We ran it in practice, and I didn’t want to run it, but Paul [Pierce] and the group talked me into running it,” Rivers said. “‘No, this will work.’ I have to say I didn’t think so, but we got a layup off of it.” In fact, the play worked in a late-game playoff situation, as part of the Celtics’ run to the 2008 NBA championship. Not every NBA coach has a son in high school to steal play ideas from, but they all have access to hours and hours of NBA game footage. Coaching staff meetings will frequently include a discussion of a play someone saw the night before in the NBA. A quick call to a video coordinator, or, worst-case, a drawing on a napkin can provide the source material. And increasingly, coaches are expanding their vision outside of the NBA to basketball overseas. Current Jazz assistant Fotis Katsikaris said that the Jazz have a play called “Spanoulis,” named after former EuroLeague MVP Vassilis Spanoulis. If “Spanoulis” is anything like Snyder’s “Horns” set — which one coach found 62 different variations of while studying the tape — it could be an expansive part of the Jazz’s playbook. Before Thursday’s Denver/Utah matchup, Nuggets coach Mike Malone brought up the Spanoulis play set, which would seem to confirm it’s still in the Jazz’s playbook even after the departure of Igor Kokoskov for Phoenix. That makes sense, as the Jazz have been running it since at least 2015. And while Malone didn’t say Spanoulis — the play, not the player — was a Nuggets target, he’s considered taking Snyder’s plays before. Stealing a play “is a compliment, frankly,” Snyder said. The theft isn’t always directly one-to-one: Frequently, Snyder and his staff will take a play idea from someone else, but may do it a little differently to fit the personnel his team has. “We don’t think we have all the answers, and if anybody can help us, we’re happy to do it,” Snyder said.